I wasn't sure I even wanted a fold-up push scooter when FP drove me to the nearest Decathlon sports shop and guided me to the patinette display. There were boxes and boxes of them, different models, different sizes, wooden ones, metal ones, ones for doing tricks on and others acting as a means of transport. FP had heard enough of my complaining about the half hour walk to the gym and as if a light bulb appeared above his head, he had suddenly come up with the idea of getting me a scooter which would make the trip more appealing. Less expensive than a bike, yet quicker than walking, he was enthusiastic about the idea and I suspected the main reason was because he wanted to have a go on the scooter himself. I hummed and hawed my way into the sports shop, still unsure if I wanted to spend 80 euros on a scooter that I may be too embarrassed to use. But standing in front of the display and looking at the almost skateboard-style models, I suddenly found myself coming around to the idea. I always wanted to be a skateboard chick. FP handed me a display model - metalic silver and yellow - and told me to give it a try. I looked aorund me, suddenly timid and refused. "I can't scoot in the middle of a shop!" The idea, to me, was absurd. "Ah sure you can," FP pointed at a sign which said customers were welcome to try out the scooters in the aisle. "Okay," I reluctantly agreed. "But I don't like the colours of this one. It's got mustard stripes," I said in disgust. My eyes scanned the rows of scooters on display until I reached one that was a lot more aesthetically pleasing. "I want to try that one," I insisted, pointing it out. FP looked and laughed. "You're joking?" My eyebrows knitted themselves together. "No. It's much more...me." He laughed at me. "Linsey, it's pink." "And it's for little girls." "Yeah, it's a Barbie scooter," he pointed out. "Anyway, it's just to see if you like using the scooter, it doesn't matter about colours." Huffily, and still a little embarrassed, I scooted my way up towards the end of the aisle, unsteady at first but slowly getting the hang of it. When I reached the end of the aisle, I turned around and scooted back towards FP, realising that I was enjoying the smooth glide of the scooter as it transported me, like a skateboard with a handlebar, to my destination. Yes, I thought, suddenly matching FP's enthusiasm. Yes, I could scoot to the gym. If I got a job in Versailles I could even scoot to work! This could be my main mode of transport. Goodbye stinky buses, hello fresh air and toned leg muscles! And so I was convinced. I walked out of that shop with a silver scooter with mustard bits (which I have since coloured in pink with a Crayola marker) and called her Margaret. I love her. Apart from one or two mishaps, everything has been going well with Margaret since I brought her home - the time I rolled over a randomly placed stick and was thrown onto the pavement onto my hands and knees was as much my fault as it was hers to be honest - and I have been scooting to the gym just as planned (not that having a scooter makes me go to the gym any more often than before, mind). A couple of weeks ago, FP borrowed Margaret to scoot to the hairdressers in the next quartier and came home and insisted he, too, had to buy a push scooter. He has, of course, bought a bigger, better, more expensive one than me, but that's men's egos for you, isn't it? FP and I have been out together all over Versailles on our scooters, me tottering along, him doing jumping and twisting tricks while he waits for me to catch up with him and the only real disadvantage is that the only other people we see out on patinettes are children. I have to be honest, I do go a little red-faced when I'm 'racing' through the streets of Versailles on my push scooter and a child on his own scooter overtakes me, wafting road dust in my eyes. Still, there's a down side to everything, isn't there? So this morning I was scooting along to the gym, gliding along the pavements, feeling the wind in my hair, feeling like a bird soaring along, when I accidently went right through a large, muddy puddle, followed by a big dog turd. "Shite!" I exclaimed as I skidded to a halt. I looked at Margaret's wheels and, as you might expect, they were covered in dog crotte. Luckily, just like dock leaves never grow far from stinging nettles, the antidote to the poison was right in front of me. I pushed my scooter to the middle of the puddle, and rolled the wheels through the water several times until all traces of poo was gone. After inspecting the wheels carefully, I pushed Margaret out of the puddle, avoiding the now smeared dog poo on the pavement, boarded my scooter, and was on my way again. It wasn't until I arrived at the gym and the skinny receptionist told me I had 'brown stuff' all up my back did I begin to panic. Dog poo. On my back. O-M-G! I ran into the female locker room, took off my jacket and, imagining the worst, almost began to cry. When I went through the turd, the wheels must have thrown it up and spattered it across my back, leaving me none the wiser but looking like a total eejit as I scooted along the main road. Mortified! Absolutely bloody morto! Examining my jacket, I realised that it was not dog turd splattered across the fabric, it was just muddy water from the puddle. With a relieved sigh I folded up Margaret, stowed her away in a locker and cleaned the mud from my coat. I still probably looked like a right eejit whizzing around on a scooter with mud all the way up my back, but it's better than whizzing around on a scooter with shite all the way up my back, I reasoned. I'm back home now, and despite the wheel cleaning in the puddle, Margaret is not coming into the apartment. She is currently propped up outside the door, waiting for me to come out with some soap on a sponge to give her a proper clean. I have just discovered another disadvantage to scooting: not only am I surrounded by kids who are better at it than I am, but scooting also runs the risk of dirty back spattering. And dog poo wheels. Who knew scooting could be so risky? That is hilarious, seriously. I thought "scooting" was a Euro phenomenon, but people in cities like NY do it, too. I just have a bicycle (which seems to be the norm here in Colorado). WOW that sounds like so much fun... I can just imagine scooting to uni instead of walking (granted its only a 15 min walk but still..), I think you have me sold! Now to find 80€! Good on you though, and its great FP got one too! TD I thought scooting was a Japanese phenomenon! I suppose it's quite popular in cities because you can take it on and off public transport really easily. I desperately want a bike of my own but I don't have the cash :-( And I had to laugh when I read 'just make sure to wear a helmet'. Alright Dad! Milk Jam I've been able to laugh about it since, but still haven't cleaned the pooey wheels yet!! I won't be laughing then! Kim it really is quite fun, except when you over cobble stones - which there are surprisingly many of in Versailles. It's also really fast if you're on a straight and smooth bit of road, a fifteen minute walk could turn into five minutes scooting! Just think of the extra ten minutes in bed! Yeah, seriously. Imagine me shaking my finger and imposing a curfew or something while you're at it. You're grounded, missy!!! I actually hate helmets because I hate helmet-hair. Apparently scooting is everywhere, but only the absolute coolest adults can do it without looking like total morons. You are a trendsetter. Hahaha everyone is into "trotinette". My cuz bought one the other day and I'm seeing him everywhere with it! Loved this post :) "Margaret", I love it. Them scooter things are oh-so handy. 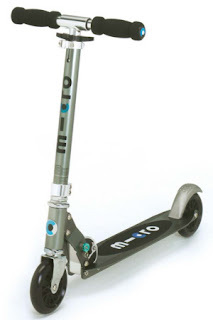 We have a stock of them in the office because the campus is pretty big, so they're great for scooting to meetings. You'll be a skater by nature before you know it! Your story about Shitie Maggie had me falling off my seat. Perhaps you and Margaret could wreak your revenge by running over the next ratty, wee doggie that gets in your way. I've always wanted a shot on one of those scooters too! Haven't been on one since I was about ten. scooting is no more risky than sitting on a metro seat. Narrowly missed sitting in poo (not sure of the exact description - animal or human?) just this week. Luckily I missed it, but it was a near miss. Will never sit on a line 1 seat again. Perhaps I should get a scooter instead...hmm..
TD I hate helmet hair too, which is why I shall not be scooting around town wearing one! Helmets also makes my forehead itch. Angele You have just confirmed my fear - I look ridiculous on a scooter! Lis Hahaha that is fantastic! At my last job the campus was really big too, and I always complained that they should have some sort of transport that we could hop on and off every time we needed to go to the other buildings (which was twice a day!). Why didn't anyone think of scooters? What a class idea! Teuchter Lol I'm keeping away from ratty wee dogs! I'm the kind of person that - no matter how ugly the dog is - always wants to take the thing home. "Can we keep it? Pleeeeease?" That's me. Chouitie Oh.MY.GOD. That is AWFUL!!!!! You poor thing! Thank goodness you didn't actually sit on it, can you imagine? I think in this case the scooter would be the best choice!